Does a perfect bird dog exist? In short, no. However, there are a number of common problems that hunters face with their bird dogs that can be remedied in order to create a better hunting partner for your needs. Listed here are common problems encountered through each stage of a bird dog’s development. This problem is most likely to occur in pointing dogs, and is indeed their number one offense. Pointers are often guilty of crowding the bird, dancing while on point, overrunning his or her nose and running directly into the bird, or only pointing for a short period of time before flushing the bird. 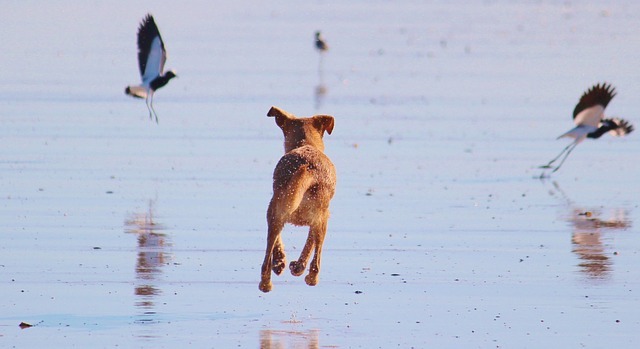 Hunters have many preferences for their pointers, such as remaining steady until given the signal to flush; remaining steady until the bird is airborne; remaining steady until the bird is shot; or remaining steady until a fetch command is given. Regardless of the hunter’s preference, a pointer that is bumping birds by breaking the point or forgoing the point altogether is limiting the hunter’s chance to shoot. Fixing this problem requires patience and a little bit of help. Recruit a hunting buddy to hold a check cord or e-collar while you flush and shoot a bird. If your dog breaks the point, the second handler will correct your dog. Other solutions include overlaying the whoa command with the correction, using pop traps, or keeping distance between your dog and the bird. A second common offense is incomplete retrievals. This problem can include not picking up the bird, not returning with the bird immediately, or dropping short. Fortunately for hunters, this problem is easily addressed with drills. One of the best ways to prevent this problem from occurring is the “trained retrieve” or “force fetch.” However, care must be taken that this technique is performed early and properly. If the dog has already been through retrieval training but has begun to get sloppy, revisiting the trained retrieve process can remedy the problem. There are a number of other drills that address specific retrieval issues. For instance, excitement drills remind the dog that retrieving is rewarding, while delayed retrieves give the dog a sense of urgency. Rewarded delivery and keeping repetitive drills fun for the dog also go a long way in solving common retrieval problems. Although having a “difficult” mouth – i.e., hard mouth, refusing to give up the bird, chomping, playing tug of war, etc. falls under substandard retrieves, it should be discussed as its own unique challenge. There are many ways to fix this problem, such as with classic techniques involving bristled brushes or dumbbells with nails. Additional methods for overcoming these problems include allowing the dog to occasionally keep possession of the bird, not allowing the dog to stop moving and thereby preventing chewing, providing light corrections with the e-collar, or positively reinforcing the dog for good behavior. Few dogs are truly naturally gun shy, However, it is not uncommon for dogs to develop a sensitivity to the sound of gunfire due to improper introduction to the sound of a gun, or due to a traumatic experience with loud noises such as thunderstorms or fireworks. In many instances, gun sensitivity can be overcome with careful training. This process involves a controlled increased gun volume in combination with decreasing distance from the sound, as well as positive associations and distractions. When addressing common bird dog problems, there are a few considerations that can be made which will make life easier for both hunter and dog. For instance, what are the resources you can use in overcoming your dog’s problems? Are there professional dog trainers, experienced hunters, or hunting breeders in you area that you can turn to for help? If money is an issue, consider the cost of trainers or training clinics. What is the cost of pen-raised birds, if this is something to which you have access. Do you own the proper equipment for training? If not, do you know someone who could lend you the necessary items? Are there areas in which you can shoot pen-raised birds, and do you have the proper permits? Another consideration is time. If you do not have unlimited time to fix your dog’s problems before the next bird season, hiring professional help might be most cost-effective. Certain problems are best left to the professionals, such as severe gun shyness, lack of steadiness, training regression, and bird mutilation. Ultimately, working with a professional trainer will not only save you time and money, but will also help you learn more about training. However, it is important to find the trainer that best fits your needs, as every training method is different. Of course, the best way to solve these common bird dog problems is to avoid them in the first place. Exposing dogs to live birds from an early age is important, as well as proper introduction to gunfire. Building a strong retrieving foundation is crucial. A close bond between hunter and gun dog helps develop a good work ethic and better cooperation, as well. Your dog is a member of the family, which is why going out of town and leaving your pet behind can be stressful. Finding a kennel for boarding your dog that puts your mind at ease is important. McHenry County Dog Boarding options are slim, but there are a couple good choices. Here, boarding your dog will be discussed. There are many options available when it comes to leaving your dog in someone else’s care. Most commonly, dog owners choose boarding facilities called kennels. A boarding kennel is a business that has been licensed to care for animals. Unlike at-home dog sitters, boarding kennels are subject to a number of rules and regulations to ensure the health and safety of your pet. Ask your friends and canine professionals for recommendations. Veterinarians, dog store owners, and trainers can all provide trusted recommendations. Next, search in your phonebook or online for kennels in the area. You can also find reviews and ratings for the facilities that you find. First and foremost, inquire with the kennels about their availability for the dates you will be gone. There is no use going through the hassle of interviewing a facility if they are unable to accommodate your pet. Appearance: is the kennel well-kept, neat, and orderly? Are there any offending odors or obvious messes? Security: are fences high enough to contain your dog? Are animals supervised when they are outside of their living quarters? What protocols are in place to prevent escape? Relaxation: are there dividers between pets to minimize noise and distraction? Is the kennel loud and chaotic, or relatively peaceful? Safety: are kennel personnel trained in pet First Aid and CPR? How often is the well-being of each dog checked? Health: are the dogs provided clean water? What are the feeding procedures, and what type of food will your dog be fed? How are instances of illness and injury handled? Which immunizations are required? Can medications be administered? How are parasites controlled? Comfort: is the temperature inside the kennel comfortable? Are dogs protected from the elements? Are ventilation, lighting, and bedding appropriate? Exercise: is the exercise area an appropriate size? How much exercise time is provided? Is exercise time solo or in a group of other dogs? When you have chosen a kennel, the next step is to prepare for your trip. First, be sure to make reservations well in advance, as many kennels run out of availability. Next, make sure your dog’s immunizations are up to date. Some vaccinations require boosters, so it is important to make sure you schedule immunizations well in advance. Finally, prepare your dog for your absence. If your pet has never been boarded before, consider dropping off your pet for a short overnight visit, or for kenneled day care, if available. When you drop off your pet at the facility, do not treat the visit as anything out of the ordinary to avoid alarming your dog. Always pick up your pet during normal business hours and be sure to call if your travel plans change. Don’t forget to ask about your pet’s visit. Did he or she show stress or anxiety, or have an upset stomach during the stay? If your dog is hyperactive and excited upon your return, limit access to food or water in order to avoid the possibility of bloat. In addition, understand that your pet may be tired for the first 24 – 48 hours you are home, as there was probably lots to do, see, and sniff while you were away! Finding a kennel for boarding your dog is not always an easy decision but your search for McHenry County Dog Boarding can be resolved with call to us here at Bull Valley Retrievers & Kennels.